In the heart of the city, Best Western Albany Motel & Apartments offers a range of quality accommodation to suit all tastes. Just 200 meters stroll to main street, with all the popular restaurants and cafes and just 300 meters to the Visitor Centre, TransWA bus terminal and the new Entertainment Centre, the ideal location to relax and unwind for the day. Harbour View King Balcony Rooms and self contained family apartments enjoy views of the harbour and beyond. Boasting the best location and views in town, Best Western Albany Motel & Apartments offers spacious comfortable accommodation for families, corporate travellers and couples. Offering a variety of styles from Harbour View self-contained apartments to economy queen rooms, Best Western Albany Motel & Apartments has a room to suit your needs. Each spacious comfortable room features split system air conditioning, remote controlled 32” LCD TV's with 2 free 24 hour new release movie channels, complimentary hi speed WiFi and bathroom with hairdryer and toiletries. Additional room features include a low priced mini-bar, tea & coffee facilities, work desk, seating area, alarm clock/radio and ironing facilities. Best Western Albany Motel & Apartments is central to all that Albany has to offer. 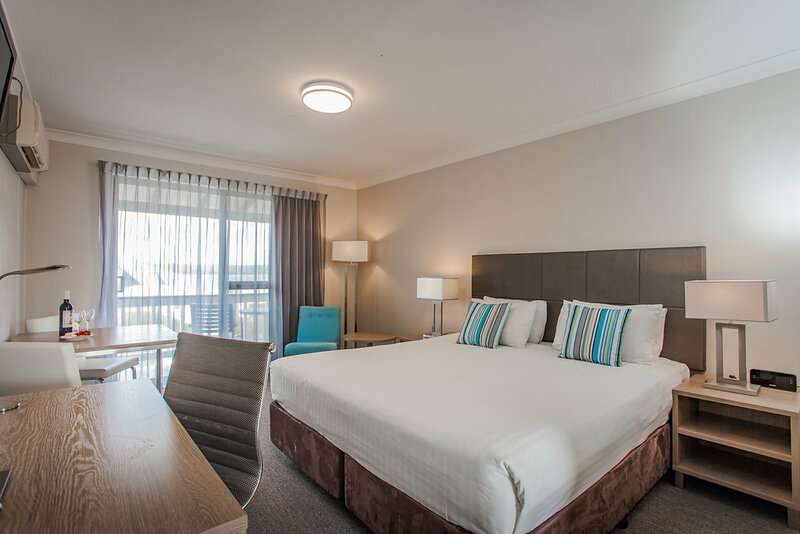 Just 200 metres from the Restaurant and Entertainment Precinct and 300 metres from the Princess Royal Harbour, the fabulous recently opened Entertainment Centre and TransWA Bus Terminal we are ideally located for you to experience the town! This charming city marks the spot where the first European settlers set foot in Western Australia and much of their legacy remains today with around 50 colonial buildings standing proudly as museums, galleries and restaurants. From convict prisons, whaling ships and taverns to quaint cottages and grand National Trust residences, you can take in almost two centuries of history on a 30-minute self-guided walk, following the Amity Trail. Make us the base for you and your friends to explore local boutique wineries such as Wignalls King River Wines, Harewood Estate and Oranje Tractor. Dine in gourmet restaurants and cafes, visit produce stores, local galleries, antiques, markets, picnic spots, parks and natural attractions. A safe port of call for migrating humpback, southern right and blue whales, spot them from the shore or hop aboard a whale watching cruise for a magical encounter. Our friendly staff can book tours at discount prices and offer advice on the best of the local area. For outstanding friendly service and a central location in Albany, make a reservation at the BEST WESTERN Albany Motel & Apartments today. Please note: a 2.9% surcharge applies to payments made with American Express or Diners Club cards. This self-contained 2 Bedroom Apartment offers Albanys most stunning views! The spacious apartment has two bedrooms, one bathroom with shower a separate lounge and full kitchen facilities. Each apartment kitchen includes a full size fridge, electric oven, grill, 4 plate cook top, crockery & cutlery and cooking equipment. Other amenities include free WIFI, free off-street parking, reverse cycle air-conditioning, 32inch HD LCD TV, DVD player, tea and coffee making facilities & iron and ironing board. Bedding configuration consists of one queen bed in the master bedroom, two single beds in the second bedroom as well as a pull-out double sofa bed in the lounge. Rates are for 4 people. Extra adults AU$35.00. Extra children AU$15.00. The room caters for a maximum of 6 adults, and a maximum of 5 children but cannot exceed 6 guests in total. Suitable for families with children, couples or corporate travellers looking for an economical option, this spacious 2 room suite has one queen in one room and two singles in the other. Other features include bathroom with shower, microwave, toaster, free WIFI, work desk, seating area, reverse cycle air-conditioning, 32" LCD TV, FOXTEL NOW AVAILABLE, tea and coffee making facilities, iron and ironing board and free off-street parking. Rates are for 4 people. Extra adults AU$25.00. Extra children AU$15.00. This room caters for a maximum of 5 adults, and a maximum of 4 children but cannot exceed 5 guests in total. This very spacious apartment has three separate bedrooms, full kitchen facilities, and lounge room, separate toilet, bathroom with bath and shower, separate laundry and private courtyard. This apartment is ideal for couples or a family. Amenities include 32�inch flat screen TV, FOXTEL , free hi-speed wireless internet access, reverse cycle air-conditioning, tea and coffee making facilities, & iron and ironing board. Each apartment kitchen includes a full size fridge, electric oven, grill, 4 plate cook top, crockery & cutlery and cooking equipment. Bedding configuration consists of a queen bed in each of two rooms and two single beds in the third. Rates are for 4 people. Extra adults AU$25.00. Extra children AU$15.00. The room caters for a maximum of 6 adults, and a maximum of 5 children but cannot exceed 6 guests in total. This 22 square metre Economy Room offers great value for money, with all the comforts of a 3.5 star motel right in the middle of town! Room features include free WiFi, reverse cycle air conditioning, 32inch Digital HD LCD TV, FOXTEL, en-suite bathroom with shower and complimentary toiletries, work desk, tea and coffee making facilities, low priced minibar, ironing facilities. Bedding configuration consists of one Queen and one Single ensemble bed. Located on the ground floor, parking is conveniently outside most of these rooms. Rates are for 2 people. Extra adults AU$25.00. Extra children AU$15.00. This room caters for a maximum of 3 adults and a maximum of 2 children but cannot exceed 3 guests in total. This spacious 30 Sq m Executive Room features a private balcony. Each renovated room offers an Executive Pillow Top King bed or 2 pillow top Singles, with deluxe triple sheet bedding. Executive rooms feature an upgraded en-suite bathroom with shower, deluxe towelling and toiletries. Other in-room amenities include free WIFI, work desk, 32inch Digital HD LCD TV, FOXTEL NOW AVAILABLE, reverse cycle air conditioning, tea and coffee making facilities, low priced minibar, and ironing facilities. Located on the upper car park level, complimentary parking is conveniently outside most of these rooms. Saturday. Rates are for 2 people. This room caters for a maximum of 2 adults and a maximum of 1 child but cannot exceed 2 guests in total. Our Harbour View Room offers expansive views over the historic town to the Princess Royal Harbour and the majestic wind farm beyond. This room has a private balcony to enjoy a glass of wine while watching the sunset or unwind after a hard days work. This spacious 30 square metre renovated room features an Executive Pillow Top King bed, an upgraded en-suite bathroom with shower, deluxe towelling and toiletries. Other amenities include free WIFI, work desk, complimentary off-street parking, reverse cycle air conditioning, 32inch Digital HD LCD TV, FOXTE, tea and coffee making facilities, low priced minibar and ironing facilities. Bedding configuration consists of one pillow top King Bed or 2 pillow top Singles. This room is located on the top floor. Rates are for 2 people. Extra adults AU$25.00. Extra children AU$15.00. This room caters for a maximum of 2 adults and a maximum of 1 child but cannot exceed 2 guests in total. A minimum of 24 hours notice is required. If cancellation occurs within 24 hours prior to check in time a charge of one nights accommodation will apply. Failure to arrive at the hotel will be treated as a no show and will incur the first 1 night/s charge. In addition there will be a $62 Albany Visitors Centre cancellation fee. * Bookings for 24 Dec to 02 Jan - All bookings to be fully paid 2 weeks prior to check-in and No cancellation after this date. * 3 night minimum stay 23 Dec to 8 Jan All rooms and apartments are NON-SMOKING. Smoking in or near the rooms or apartments will attract a sanitisation fee of up to $250 or one-nights accommodation whichever is greater. A valid credit card must be produced upon check-in. Otherwise a key deposit of $250 will be required.